The Eaton range of 10kA/15kA high performance Miniature Circuit Breakers (MCBs) has been designed to meet the latest UK, European and International standards, with ratings from 1A up to 63A. Eaton’s range of 10/15kA high performance miniature circuit breakers (MCBs) are manufactured and tested to IEC EN 60898, and IEC EN 60947-2, meeting the latest UK, European and international standards, with ratings from 1A to 63A as standard. DIN rail mountable and suitable for use with both pin and comb type busbar systems. 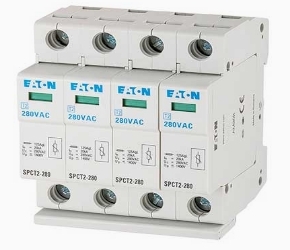 Eaton’s MCBs are suitable for use on 230/400 VAC systems and are calibrated for use at 40°C. These devices suite with the other modular devices including RCBOs, RCCBs and isolators, for use within Eaton Memshield 3 Distribution boards and a wide range of other applications. The Eaton MCBs are fitted with box clamp terminals suitable for use with cables up to 25mm2, and have a unique box clamp barrier to prevent incorrect cable insertion. Available with B, C and D characteristic curve as standard. Type C MCBs are most commonly used in commercial and general applications where there are lighting or motor loads involving high switching surges that may cause unwanted operation of type B devices. Type D devices are more commonly used on general industrial applications with much higher inrush surges.